John Pilley uses old-school psychology to train his border collie in Chaser: Unlocking the Genius of the Dog Who Knows a Thousand Words, co-authored with Hilary Hinzmann. What a coincidence that the methods he uses, based on his experience as a professor of human psychology, look a lot like force-free dog training! With one exception: Like Ted Kerasote in Merle’s Door, Pilley turns to an aversive method to curb Chaser’s “chase drive.” While Kerasote used a shock collar, Pilley uses a mighty jerk of a long line and a stern “No.” It’s hard for me to say these techniques are wrong, wrong, wrong, because as far as reported, they prevented the dogs from chasing things, and neither Merle nor Chaser developed aggressive or fearful tendencies as a result. I can say that knowing what I now know, I would never use either method on a dog. Otherwise, the book is a joy to read. I love that this retired professor refers to himself as Chaser’s “Pop Pop” (because that’s what his grandson calls him). Throughout, Pilley emphasizes how much fun it is for Chaser to learn new words. He turns down an offer to let another scientist work with her, which would have meant more academic acclaim, because that would mean having Chaser live with someone else temporarily. Above all, Chaser is a family dog. When Chaser appears on the Today Show, Pilley feels bad that Chaser doesn’t have a chance to play with her toys after fetching them by name for Matt Lauer. Chaser is supposed to get to play with her toys as her reward for fetching the right toy. Like Wallace: The Underdog Who Conquered a Sport, Saved a Marriage, and Championed Pit Bulls — One Flying Disc at a Time, Chaser is a book about a dog of extraordinary achievement. While both dogs are special, neither would have been a superstar without the devotion of the “handler” (owner…trainer…Pop Pop, whatever you want to call them). Pilley works with Chaser for hours a day. With that much dedication, I bet any dog of above average intelligence could learn quite a few words. As I said in my post about Wallace, I wish I’d known about flying disc, or at least been able to turn catching soccer balls into a “job” for Isis. Reading about Chaser makes me wish Leo and Mia had that much enthusiasm about anything. Leo especially. Mia is content to sit in the backyard with her Jolly Ball and bark at us. But Leo’s still young. He needs stimulation. We took him to a nose work class, and he liked it all right, I guess, but not enough for me to keep at it. It seemed like a lot of money and effort to drive to a class where each dog only gets instruction for a few minutes at a time. Any thoughts, friends? Remember, Leo is leash-reactive, so long walks are challenging, but I think that’s what he enjoys most: excursions. It’s kind of nice on really cold evenings. I take him somewhere well-lit, where no one else is out who will incite his barking and lunging. Aside from that, he loses interest in fetch fairly quickly. 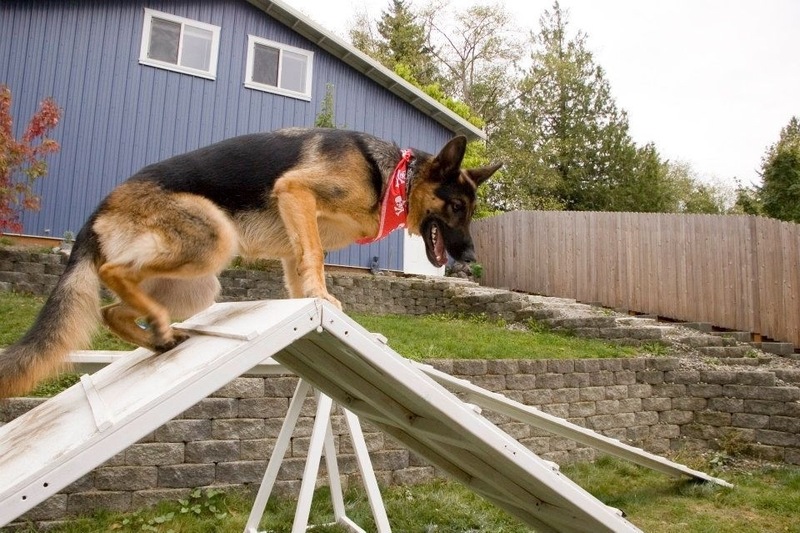 We have agility equipment, but like everything else, he goes over the A-frame once, maybe twice and is done with it. Same with Rally-O. The kid only wants to practice his sits so many times. Then I get a blank stare. Honestly, I don’t think he’s as bright as Chaser, otherwise, I’d start acquiring hundreds of toys. What does he like to do? You could try geocaching, or weight pull or maybe look into getting his trick dog champion title. We have seen that these types of drills can not only provide mental and physical stimulus, but can also build a dog’s confidence, which can help with other behavioral issues. I love Chaser’s story & have been impressed with this dog’s knowledge of words for a while now!! I’d go the treat option too as SlimDoggy suggests. My dog Scooter ‘loves’ running beside the bike & if we can’t do this then its nose work & a bit of agility – not much of the agility cause he’s over it pretty quick like your pup. when my sister were kids we had a dog named Spot we talked to her like she was another person and she responded like we expected her to. My mother was always a dog [animal] lover and she put a big mohair chair in our living room for Spot,since that is where we entertained company. I remember one time when she saw a neighbor coming to our house with her small child and Mama said to Spot don.t you let that baby break any thing on my ‘whatnot’ [which was a small shelf in a corner of the room] to make along story short, when that baby went near Mama’s whatnot Spot stood in front of it and growled,the baby moved and never went back. I could write a book on that dog and she understood every thing we said to her. I enjoy your writings very much. I keep them all. One thing my husband does with Morgan that she LOVES is a variation of nose work. It’s a game. He tells her to go in her crate and platz, then he goes around the house and hides treats in different places. Then, he releases her and they go around in a sort of perimeter. He will tell her to “check it” and she looks around until she finds the treats. She absolutely adores this game, and it’s nice because you don’t have to go out and freeze in the dark on cold winter nights, especially if you don’t feel well. You can spend as much or as little time on it as you and the dog want. She also really loves doing basic obedience, and they will do it in the house with no leash. Her tail wags like a metronome when she’s doing work with him! Is “platz” the cue you use? I love it. Thanks for the suggestions everyone! Keep them coming!